I’ve got dough on my mind all of the time today… and after a quick little knee surgery yesterday, I am stuck on the couch with the kitchen just out of my reach. Sigh. 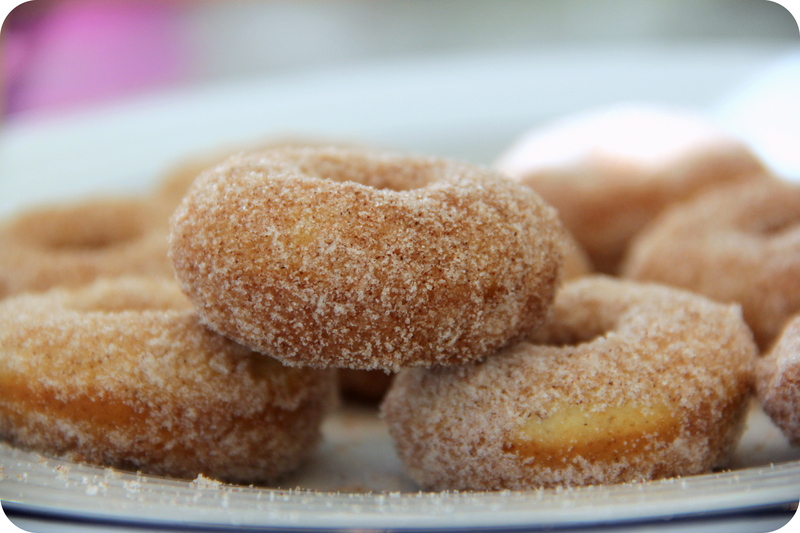 On a great note, I’ve been asked to bake doughnuts for a fall cider birthday party here in town; therefore, it would only be right to test out many recipes beforehand – sort of a quality control issue, no?! And believe me, doughnut testing is a task best left to someone who just might be made of ¾ sugar. I love sweets. I also have a thing for foods that have a nice visual texture to them. And what’s better than a dessert that is sweet and has lots of crunchy sugar crystals scattered on the outside? Not much. These doughnuts had some serious deliciousness going on. They are baked, not fried, take 5 minutes to whip up, and are ready in no time. The original recipe called for a muffin tin, yet I went ahead with a mini-doughnut pan. The sugar was a lot and perhaps the ratio of sugar to doughnut would have been better suited for a muffin shape, but they were still SO, SO good. While I was in search of a cider sugar doughnut, these were not them. These have a wonderful orange flavor to them which would make them just perfect for a brunch… a brunch that includes sweatpants (or lounge pants if you prefer to up your game a bit), champagne and a sitter watching the kiddies… because THAT is the way brunch should be done. In a heavy bottomed pan, heat the 1/3 cup butter, and cook over medium-high heat, stirring frequently, until browned and nutty smelling. Pour into a mixing bowl and allow to cool completely to room temperature. Preheat your oven to 350F. Grease and lightly flour a 12 cup muffin tin. 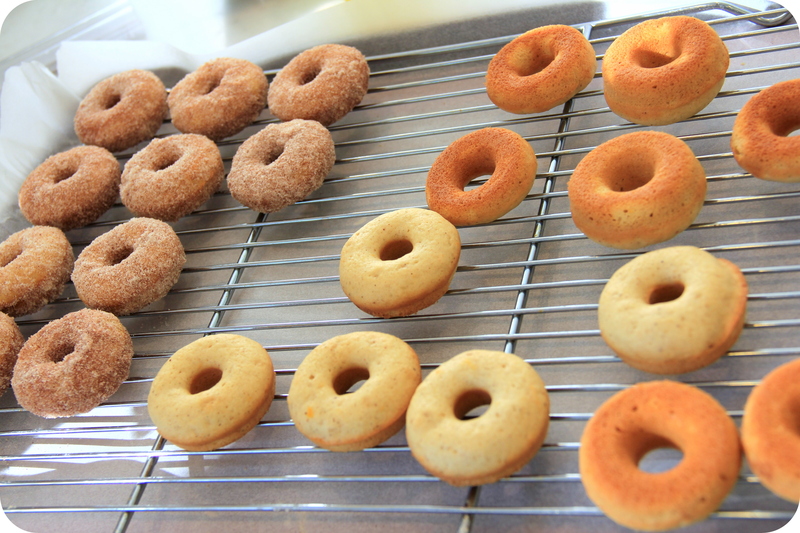 *I used baking spray in a non-stick mini doughnut pan which worked perfectly. Add the sugar and egg to the cooled butter. Beat with an electric mixer until all creamed together, lightened in color, and fluffy. In a separate little bowl, combine the flour, baking powder, salt, spices, and zest. Add the dry ingredients in increments to the butter-sugar mixture, alternating with the milk and beating until fully combined after each addition. Divide the batter evenly into the cups of the muffin tin. Pop into the oven and bake until golden brown and fragrant, about 20-25 minutes. While the puffs are puffing, put the melted butter in one shallow bowl and combine the sugar and cinnamon in another one. When the puffs come out of the oven, use a knife to gently pop them all out of the muffin tin. 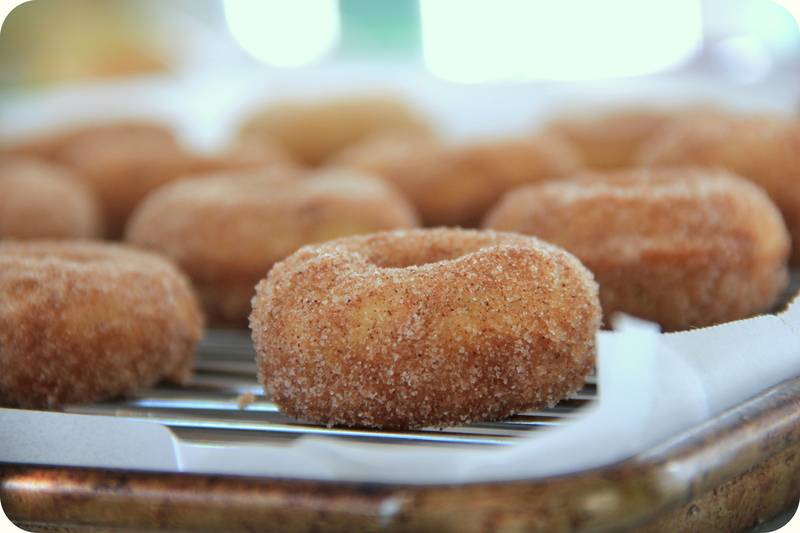 One by one, dip each puff in the melted butter – get it all over it – then roll it in the cinnamon sugar.